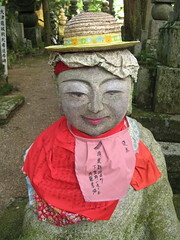 My previous visit to Koya-san was just a day trip. 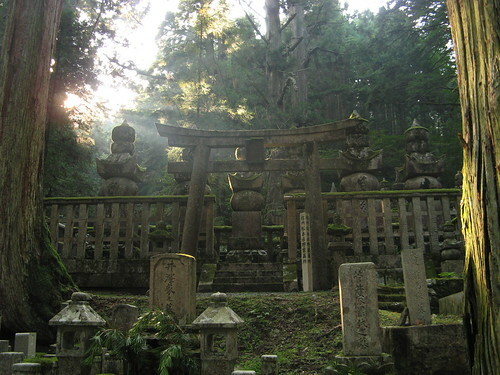 Lorraine and I took in the Kobo Dashi mausoleum and the graveyard and left. This time, thanks to a generous gift from her mum, Tania and I stayed the night in one of the 52 temple lodgings that crowd the town. We saw the lantern hall with its dark wood interior and roof full of (now electric) lanterns, plus a few genuine oil ones at the back. They’re reported to have been burning for hundreds of years. For the first time on our travels we chose to eat the food supplied by the accommodation. It was the full experience. First we were told to go soak in the traditional baths. The guys’ changing room was under the stairs and as I got back into my yukata I heard the dozens of new arrivals ascending above me. We’d thought it was just us and the monks until then. 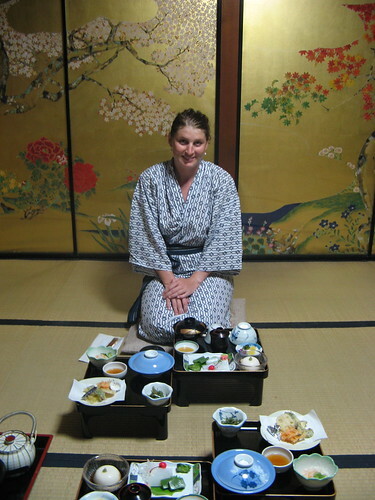 Dinner was served in a private room, on little black trays as is the Japanese way. A bowl of rice on one side to share, various glutenous substances of questionable origin, something that looked like a mini-omlette but stretched like rubber and an assortment of pickled vegetables I couldn’t directly identify. Dessert seemed to be a mousse of tofu with soy-sauce dressing, though it may have been the entrée. We ate what we could then returned to our room to dress before heading back to the ancient graveyard. There were a few other people taking in the atmosphere and setting up their cameras for night photography. I would say the Lonely Planet really over-hyped it. 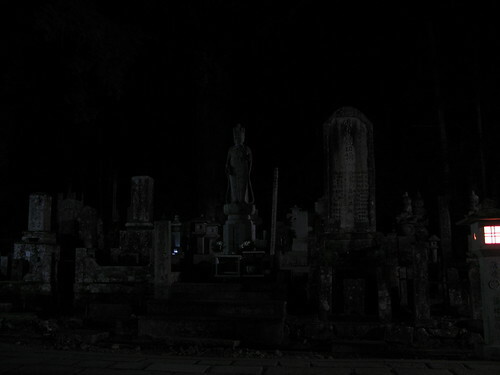 Yeah it’s big and mossy and stuff, but it’s just a graveyard. Had they hired people to pose as statues and then leap out at tourists I’d have been more impressed. Morning “chanting” was scheduled for 6:30am, but someone must have got the wrong information because the bus load of Japanese that arrived last night were up at 5am and continued sliding a particularly creaky door back and forth for 90 minutes. One nosey neighbour even opened the first of our two doors, then presumably saw our slippers and retreated. I stood guard for a while but they didn’t return. At the appointed time we were called to the main hall and the chanting began. The first 10 minutes were ok, but the next 40 were kind of repetitive. I even saw other guests checking their watches. Of course it made no sense to me but I’d like to know if anyone else understood it, or if what was said is more like Latin to Europeans. Twitter is blocked at work, so been missing your updates… only saw “Matterhorn? Does it Everest!” a few days ago but I am still laughing. Twitter blocked? that’s lame. Have you been over-posting? That day photo is beautiful! Looks just like a set out of Crouching Tiger….